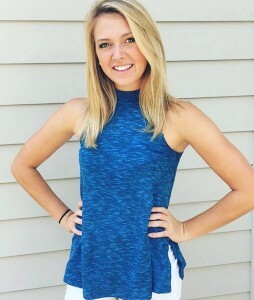 If you’re a University of Georgia student, alumni, or one of the school’s biggest fans, then keep reading because this post is for you! While we do love our fair share of traditional weddings, we’re always willing to push the boundaries and get creative with exciting new wedding themes! In Athens, Georgia, one of our favorite things to do is show our school spirit, and if you’re having your wedding in town, we’d love to see you representing UGA! 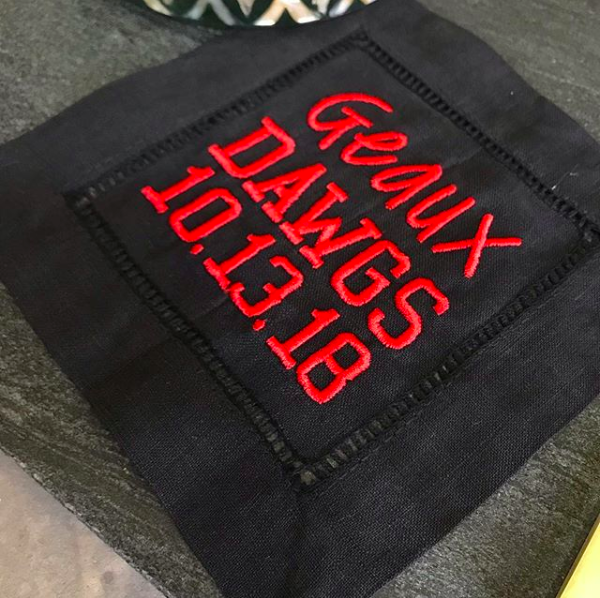 Having a college-themed wedding is a great way to show what is most important to you: your family and friends, your partner, and of course, the Dawgs. If you’re not already engaged, we’ve got some advice for you. 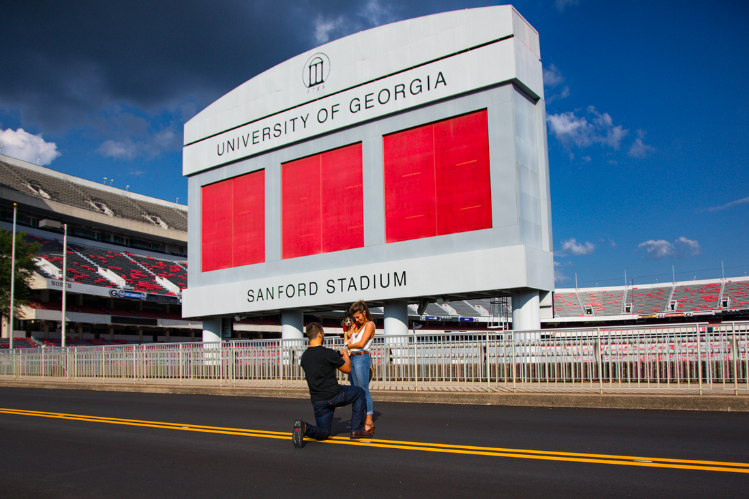 Go to a special spot on campus like the stadium or the chapel bell, get down on one knee, and propose! 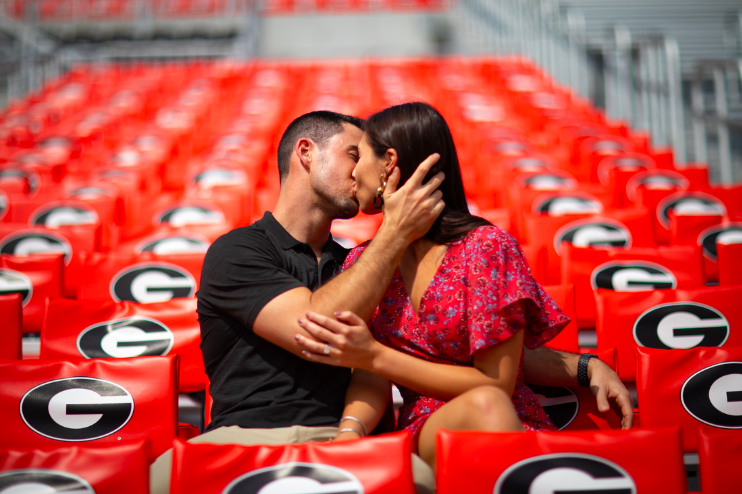 An on-campus proposal is the perfect way to ease into having a UGA themed wedding. With so many beautiful locations on UGA’s campus, you’re sure to find a place where she won’t be able to say no. After the engagement, be sure to head back over to Athens to take some pictures on-campus and around the city! Athens is the perfect place to have your engagement photo shoot! Finding a venue in Athens for your UGA themed wedding will be the easiest part of the whole process. Although, with so many great options to choose from, deciding between them may not be as easy! 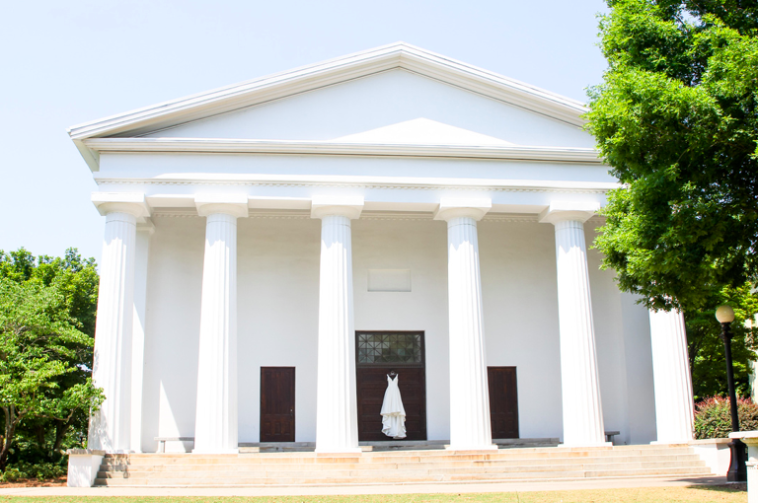 The chapel is UGA’s most popular wedding venue, and with its great location, historic charm, and beauty inside and out, it makes for a perfect on-campus venue! UGA allows weddings on their lush, picturesque lawn spaces across campus if you’re looking to have an outdoor ceremony. You can also visit the Tate Student Center website to find more options for on-campus venue locations. If you’re looking to get really creative, wait til football season and try having a tailgate wedding! This new trend is on the rise and is a great way to have a fun, laid-back atmosphere on your big day! With so many weddings happening in and around Athens, there are tons of local vendors to help personalize your UGA themed wedding! Mayfair Monograms is a local business run by Lynn Hughes. Lynn can personalize your wedding day by monogramming anything from your napkins to your wedding dress! Classic City Confections can provide the wedding cake on your big day that’s personalized to your tastes! You could even have the cake topper be red and black to really let your school spirit steal the show! Every wedding needs flowers, so check out Always Always Flowers, Athens premier florist. Their flowers are beautiful and bright, and I’m sure they will love the idea of making an arrangement that reflects your UGA theme! After everything is all planned out, it’s time to decorate! Adding those personal touches is essential to making your wedding really show the spirit of UGA. Red is the most essential color to incorporate into the ceremony and reception areas but touches of black are also imperative. Using red or black tablecloths with the opposite color napkins, menus, and place cards is the perfect way to decorate your tables at the reception. Don’t forget your beautiful red and black centerpieces as well. Try tying red bows around the back of the chairs and having red flowers all around the venue; we highly recommend roses, the flowers of love! During the ceremony, have your flower girl throw out those red rose petals and walk down a black aisle to really make them stand out. For your bridesmaids and groomsmen, have them wear black with red accents such as the shoes or the tie. 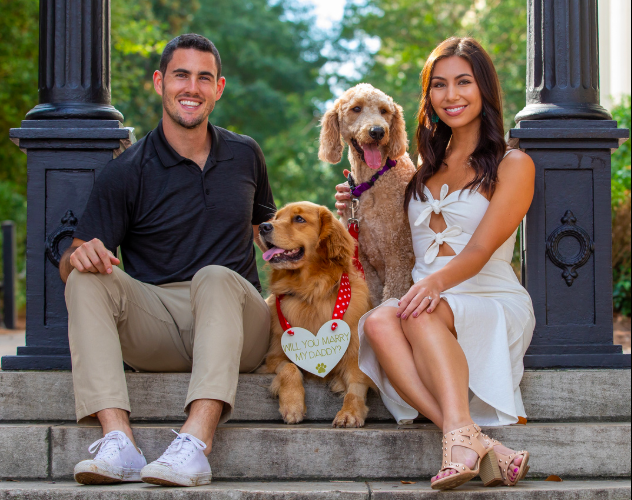 There are so many ways and reasons to have a UGA wedding. If your blood bleeds red and black, then what’s stopping you? Time to start planning!